Acquisition History: Ellis R. Hatch Jr. WMA was purchased in four phases. 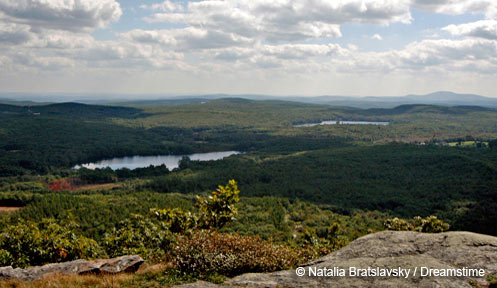 In 1983, 863 acres were acquired by the NH Fish and Game Department. In 1990-1992, the Land Conservation Investment Program (LCIP) purchased three adjoining parcels and assigned management responsibilities to the Fish and Game Department. With the LCIP acquisitions, Ellis R. Hatch Jr. WMA is now one of the largest WMAs in the state. Description: One of the Department's most diverse wildlife management areas, Ellis R. Hatch Jr. WMA is comprised of upland forest, with mixed stands and various age classes of hardwoods, hemlock and white pine. It has important deer wintering areas, several ponds and streams, and a network of wetlands for waterfowl. The topography is hilly and steep in places. Three mountains -- Moose, Perkins and Rand -- are located within the WMA. Although there are no clearly marked trails, climbers willing to bushwhack will enjoy nice views from parts of the mountains' ridges. The ridgeline of the mountains separates the two main water bodies on the property, Jones Pond and Mountain Pond. The 12-acre Mountain Pond is manmade, and Jones Pond was enlarged from a small water body into 20 acres when a prior owner created an earthen dam on Jones Brook. The local name for the original pond is Pocomoonshine, and it is called that on some maps. Jones Pond, stocked with brook trout, is a popular hike-in angling destination and has fly-fishing-only regulations. Mountain Pond is also stocked with brook trout and has single-hook artificial lure and fly-only regulations. Mountain Pond also has a 12-16 inch slot limit on brook trout. Common Wildlife: An abundance of wildlife occurs at this WMA, including moose, deer, bear, coyote, grouse, otter, beaver, turkeys, snowshoe hare, chipmunks, squirrels, hawks, ruffed grouse, American woodcock, many different songbirds and waterfowl species. Aquatic life abounds in the WMA's wetlands, ponds and streams. Special Notes: Be sure to check the current NH Freshwater Fishing Digest for current fishing regulations. Only unmotorized craft are allowed on the waterbodies. Boats may not be left overnight. Directions: Ellis R. Hatch Jr. WMA abuts Kings Highway along the Middleton/New Durham town line. A small parking area off of Kings Highway connects to a gated access road that leads to Jones pond. In Brookfield, an access road leads to Mountain Lake - from Route 109 in Brookfield, take Governor's Road, then Mountain Road to its end. Limited parking is available at the gate with foot travel only allowed to the pond.